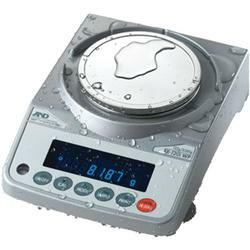 A&D has applied its expertise in the design of waterproof scales to develop the world’s fi rst IP-65 rated 1 mg resolution balance. It is dust-tight and can even be sprayed with water. Think of it as an “accident-proof” balance suitable for use in environments that can render other balances inoperable. What does “IP65” mean? The International Protection (IP) Code, as defi ned by the international standard IEC 60529, specifi es the degrees of protection provided by enclosures. The two digits next to IP indicate the levels of protection against solid foreign objects (first digit) and water (second digit). For example, a device rated as IP65 should permit no ingress of dust (level 6) and withstand water jetting from any direction (level 5). Standard RS-232C Interface with a PC, printer or other peripheral devices. In accordance with GLP and LIMS regulations In accordance with GLP and LIMS regulations be printed out using A&D’s AD-8121B or a PC. liquid material. A waterproof RS-232C cable (AX-KO2737-500) is available as an option. Compact general-purpose balance, can be installed almost anywhere. Casing construction, strong protection against dust and water. time of one second, to read a displayed value after a sample is placed on the pan, has been achieved. 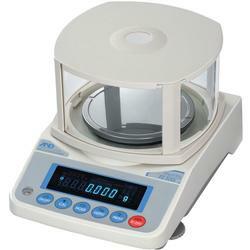 Multiple weighing units with most of the common units used around the world. Comparator Indicators, displaying the comparison results. Hold Function, provided for weighing a moving object such as an animal. Breeze break, provided for the FX-120i WP /200i WP /300i WP, for more accurate weighing. Underhook, provided for suspended weighing. (Fxi-09) are available. When any one of these is used, the balance does not comply with IP65.